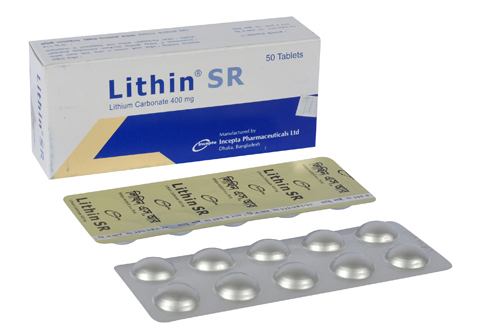 Lithin SR Tablet: Each Sustained Release tablet contains Lithium Carbonate BP 400 mg. Treatment and prophylaxis of mania, bipolar disorder and recurrent depression. Adult and child over 12 years, treatment, initially 1-1.5 g daily; prophylaxis, initially 300-400 mg daily. Tiredness, loss of appetite, nausea, vomiting, diarrhoea, hands shaking, memory problems, increased thirst and consequently passing urine more often by day, and perhaps also by night. Decreased tolerance to lithium has been reported to ensue from protracted sweating or diarrhoea and, if such occur, supplemental fluid and salt should be administered under careful medical supervision and lithium intake reduced or suspended until the condition is resolved. Category D. An increased incidence of cardiovascular abnormality has been noted in infants of women given lithium during the first 3 months of pregnancy, such use should be avoided unless essential. Breast feeding is not advised unless the benefits of lithium use outweigh the advantages.